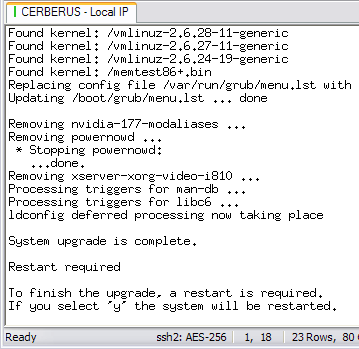 It is easy to do an in-place upgrade of Ubuntu Server from 8.10 ‘Intrepid Ibex‘ to 9.04 ‘Jaunty Jackalope‘. You can do this remotely over ssh or whatever you use to control your server. Best practices say to make sure to backup your server before doing the upgrade. I’ve done several servers this way with no issues! Follow any prompts to first upgrade the current distribution with the newest packages, then do the release upgrade.